We are thrilled to be co-hosting what is sure to be an incredible evening in Sydney on Thursday November 29th. Feral Media and our good friend Scarlett Di Maio (aka Red Door) have gathered together some of our favourite Sydney acts for a fantastic evening of ecelectic & experimental music at the Red Rattler in Marrickville with all proceeds going to the Dirty Shirlows Collective. 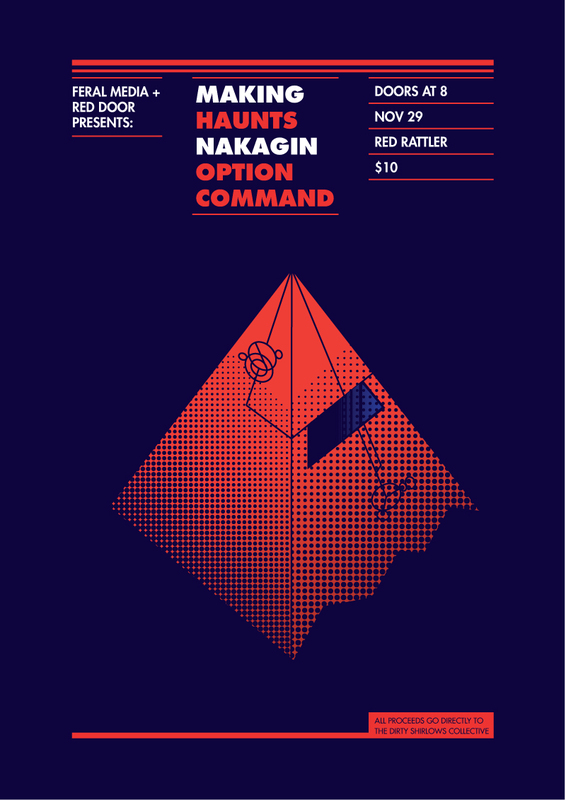 Playing on the night are Making, Nakagin, Haunts and Option Command and to top it all off we have put together some great door prizes and giveaways for the night. The Red Rattler is located at 6 Faversham St, Marrickville with the evening kicking off at 8pm. Further details can be found on the facebook event here. If you are in Sydney on November 29th we would love to see you there! This entry was posted in Events and tagged broken chip, dirty shirlows, haunts, making, nakagin, red door, red rattler on November 22, 2012 by feralmedia2.